World Impact: Global Percussion, Virtual percussion from Vir2 Instruments. 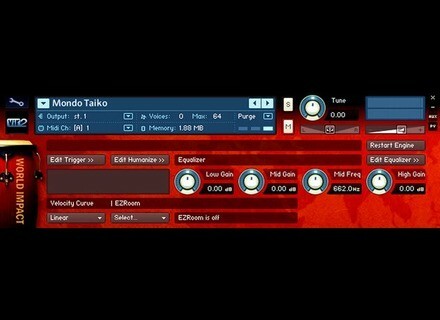 Vir2 has announced the World Impact: Global Percussion Kontakt Player-based virtual instrument. The collection includes hundreds of percussion instruments from Africa, the Middle East, Asia, Australia and more. A multi-gigabyte collection of Japanese Taiko drums recorded from multiple microphone positions forms a central part of the library, according to Vir2. Vir2 says each instrument has been recorded with numerous alternate takes and velocity layers. World Impact has the same engine that lies beneath Vir2's Elite Orchestral Percussion, designed to allow instant access to varied articulations such as chokes, rolls, flams, and ruffs, as well as patterned loop programming for both traditional and synthetic creations. The engine also allows for the layering of effects such as reverb, convolution, delay, chorus, phaser and more. The product is powered by Native Instruments' Kontakt engine and is therefore compatible with VST, AudioUnit and RTAS plug-in formats allowing it to work within any major sequencer, according to Vir2, in addition to standalone use. Puremagnetik Microtron Tape 1 Library Microtron Tape 1 contains a recorded Brass, 8 Voice Choir and String Section library.